An international team of scientists has developed a new 3D nowcasting system that is said to predict the likelihood of precipitation in a given location 10 minutes in advance. The solution uses a combination of phased-array radar and computer algorithms that make predictions based on the data gathered from the radars. The group includes scientists from the Riken Advanced Institute for Computational Science (AICS), National Institute of Information and Communications Technology (NICT), and Tokyo Metropolitan and Osaka universities in Japan. The team will use the system to determine if the experimental forecasts, based on data that is updated every 30 seconds, could be used to prevent damage from torrential rains. Nowcasting traditionally refers to short-term weather forecasts made in real time using parabolic radar antennas, which take five to 10 minutes to scan approximately 15 layers of the entire sky. However, a phased-array radar was recently installed on the Suita Campus of Osaka University, which can scan the entire sky in 10 to 30 seconds, looking at approximately 100 angles with a range of 60km (37 miles). In an effort to improve the forecasting capability of the radar, the group developed an algorithm that takes the observational data from the radar, updated every 30 seconds, and makes rapid forecasts based on the 3D rain data. The forecasts currently cover the Kansai region of Japan and are available online. Takemasa Miyoshi, who leads the project at Riken AICS, said, “Torrential rains can have tragic consequences, as they lead to flash floods or dangerous landslides in a matter of minutes. We hope that being able to forecast them, even 10 minutes in advance, will help us to minimize the damage they can cause. The group has also developed a forecasting model based on phased-array radar data using the powerful K computer, and though it cannot be currently implemented due to the need for massive computational power, the group plans to continue that work with the hope that it may eventually be implemented on future computers, allowing much more accurate forecasts of torrential rain. 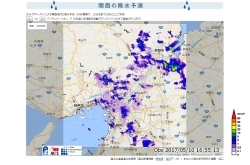 To view the rain forecast over Osaka, click here.